Bringing IoT applications to market: NSPs’ major role. 5G wireless wide-area networking technology promises to leave an indelible mark on any industry that stands to gain from the rapid evolution of IoT, and will place network service providers in an ideal position to serve this market, according to Vitria’s Vice President Chris Menier. 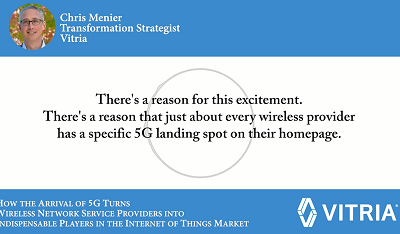 Watch this brief vidcast to learn more about the effect 5G and IoT will have on NSPs, and see why Menier predicts that 5G will put NSPs in an entirely new position to add value and generate important new streams of revenue.